The Nissan Titan XD is a full-size, rugged, and popular pickup truck. The Nissan truck comes well-stocked with a wide variety of useful technology tools. In addition, this durable vehicle also offers large numbers of genuine accessories that are custom-designed and fit to the specifications of each customer. The Titan XD provides drivers and passengers with both internal and external genuine accessories. 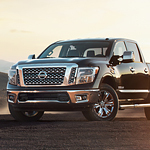 On the external front, the new Nissan Titan XD provides a configurable rear bed system. The generously sized Titan XD bed also has room for special Nissan Titan Boxes storage system. This system includes a number of high-capacity storage bays that are lockable for security. Other accessories for the bed include specialized liners that resist damages as well as bed extenders that allow XC operators to carry extra long loads. The Nissan Titan XD is just as impressive on the interior as it is on the exterior. Even though it is a full pickup truck, the Titan XD also includes trunk-like storage space under the rear seat. This allows occupants going on long trips to enjoy sedan-like comfort and to securely store valuable or fragile items.